Westrec Marinas’ new Haulover Marine Center in south Florida is one of the most sophisticated recreational boating facilities ever built. 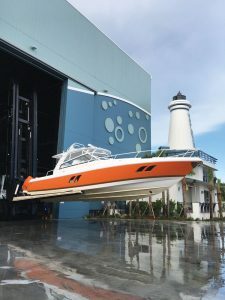 Since the new Haulover Marine Center opened in mid-September, John Louis, the Southern Area Regional Manager for parent company Westrec Marinas has been taking owners of large boats for tours on a daily basis. The dry-stack building is over 600 feet in length about the size of 2 football fields—and is over 82’ tall with the highest rack being some 72’ up in the air. 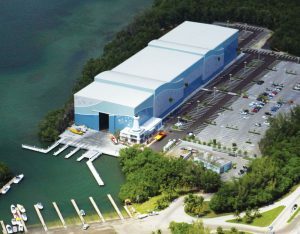 Realizing the environment in which they were building, Westrec constructed the facility to withstand a Category 5 Hurricane and its accompanying 165-mph winds. The building has 508 dry-stack spaces with each having its own dedicated sprinklers. The fire-fighting system is zoned so that if a fire breaks out, the sprinklers in that quadrant, not throughout the entire facility, will be turned on. For all this high-tech protection, Haulover Marine Center charges reasonable rates of $23 to $33 per foot per month, depending on the overall size of the boat. Other features of Haulover Marine Center are courtesy slips, a retail store, a dedicated bait store, and a bath house. Beer and wine are also sold on site. The most impressive pieces of the whole operation just might be the two Wiggins fork lifts that cost more than $1.6 million. Affectionately named Atlas and Colossus, these machines have a 78,000-pound capacity, 29 ½’-long forks and a maximum 78’ tall clearance to reach the top shelf of the dry-stack facility. These are the largest marine fork trucks in the world. Prior to their construction this year, a 50,000-pound machine with 15’ long forks was considered huge. The Wiggins machines are so high-tech that they can receive launch orders on an iPad. 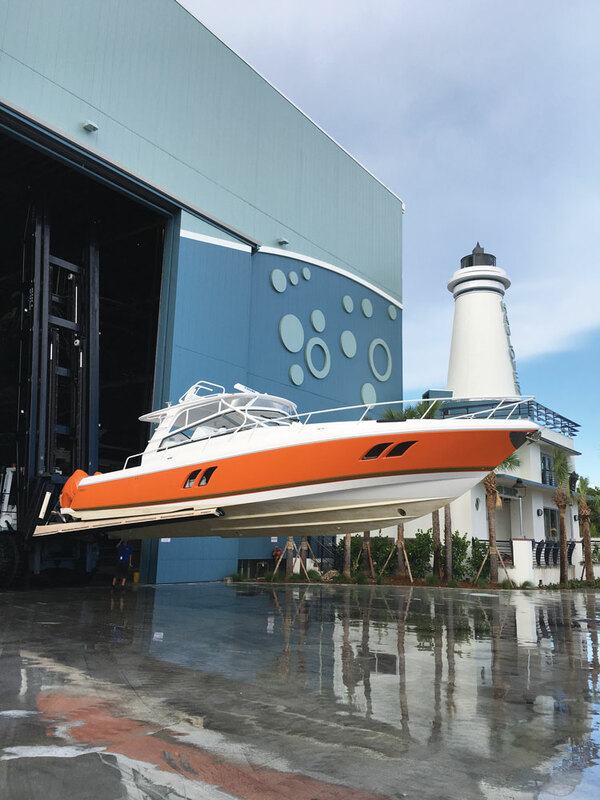 Louis oversees some 10 Westrec Marinas in the Sunshine State, but the last few months he has spent most of his time at Haulover personally overseeing every detail of the opening of this new $22 million facility. He brought in Rick Van Lenten to manage the dry storage. Van Lenten has more than 30 years of experience in all aspects of marina operations. Westrec Marinas is one of the largest owner-operators of Marinas in the United States. Based in Encino, California the company also offers professional management and consulting services for public and private entities throughout the country, including the Caribbean and South America. 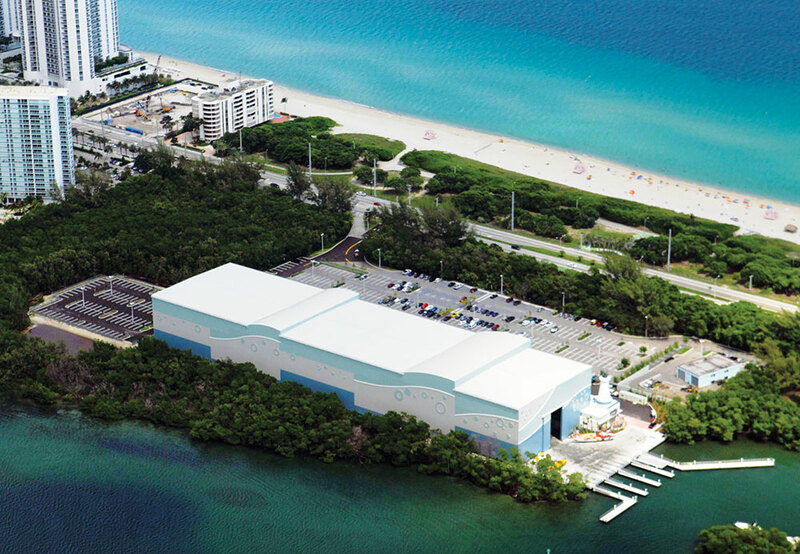 As we always hear from real estate, the most important element of any new business is, “Location, location, location.” The new Haulover Marine Center is located in a park owned by Miami-Dade County. Situated directly on the Intra-coastal Waterway, the facility is less than a mile from Baker’s Haulover Inlet so there’s easy access to the Atlantic Ocean and from there it’s almost a straight shot to Bimini. 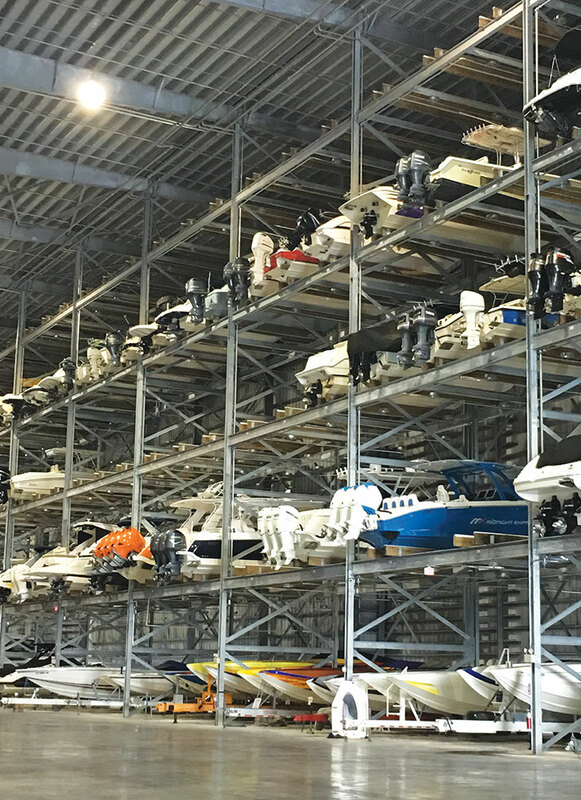 Westrec has a long term lease with the County and also operates Haulover Point, which is a retail store and a fuel dock located at the southern end of Haulover Park, which is adjacent to the most popular inland sandbar and one of the best-known beaches in south Florida. 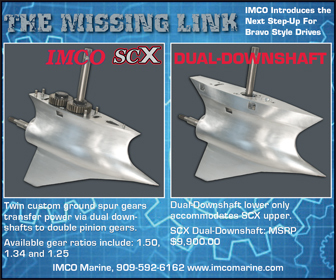 Speaking of performance, while some marina owners seem to want to shun offshore go-fast boats, Louis and Goldman welcome them. Goldman is a former offshore powerboat racer who sells Marine Technology Inc. (MTI) high-performance catamarans and V-bottoms. Louis owns a 35’ Motion powered by twin 300-hp Mercury outboards and a 31’ Fountain center console. They are both working closely with Stu Jones, President of the Florida Powerboat Club, an organization that produces and promotes poker runs and performance boating. This year Haulover Marine Center is going to be the starting point for the 24th Annual Key West Offshore Poker Run that will take place November 9-14. Goldman and Louis are both planning to participate in the run. 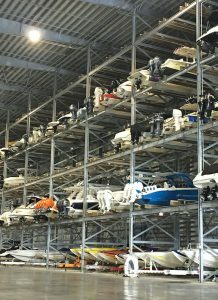 Xtreme Powerboats will offer new and used boat sales and brokerage, full service and parts for Mercury Marine and Yamaha. In addition to selling MTI boats, Goldman said he is talking with the Iconic Marine Group about taking on some of their product lines, which include Fountain, Donzi, Baja, and Pro-Line. Regardless of the type or brand of boat, Louis is confident that he will have the new Haulover Marine Center at full capacity sooner rather than later. “Everybody who sees the facility wants to bring his boat here,” he said. It’s easy to see why.